Drugs in development and on the market are dogged by serious side effects. Given the current worldwide type 2 diabetes epidemic, it’s hard for drug developers to ignore the huge potential for new, better, and safer oral drugs. The U.S. market alone has reached $5 billion annually, and the prevalence of type 2 diabetes continues to rise across the globe. Approximately 250 million people worldwide have diabetes, and type 2 accounts for up to 95% of all diabetes cases in the developed world. Serious side effects continue to surface for existing drugs, though, forcing the FDA to revise the guidelines: All new drugs under developed will have to show that they do not increase the risk of cardiovascular events. The various glucose-lowering therapies currently under development will face tougher safety requirements. Drugs already on the market have stronger safety warnings, meaning that clinicians have fewer safe options. Additionally, recent evidence seems to point away from the use of treatments too aggressively. Type 2 diabetes is characterized by insulin resistance, a condition in which fat, muscle, and liver cells don’t use insulin properly. People with type 2 diabetes are at increased risk for serious illnesses including cardiovascular disease, blindness, kidney failure, amputations, fractures, frailty, depression, and cognitive decline. In prospective epidemiologic studies, the incidence of many of these diseases is directly associated with the degree of hyperglycemia as measured by the plasma A1C (glycated hemoglobin) level. This is indicative of mean blood glucose level in the previous two to three months. The goal of diabetes therapy is to maintain the A1C level at about 7%, normal being about 6%. Diabetes care is undergoing a rapid chance in which insulin is being prescribed earlier and for more conditions to delay the onset of full-blown disease, according to a study released this month by Scientia Advisors. In light of that trend, as more drugs go generic, companies offering more expensive medications will face resistance in markets, particularly those constrained by economics. Current treatment guidelines emphasize attainment of normal glucose levels through initial lifestyle intervention and metformin. Additional recommendations include rapid addition of medications, transition to new regimens when target glycemic goals are not achieved or sustained, and early addition of insulin therapy in patients who do not meet target goals. 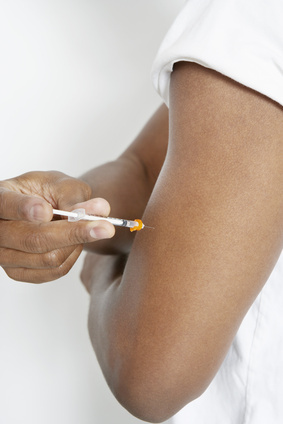 Clinical trials have suggested, however, that aggressive insulin treatment targeted toward reaching normal or lower glucose levels may also pose problems in certain individuals. The interim results of the NIH-sponsored ACCORD (Action to Control Cardiovascular Risk in Diabetes) study is illustrative of the various complications in trying to achieve near-normal insulin levels. The trial compared a clinical strategy aimed at near-normal blood sugar levels to a strategy to reach more standard blood sugar levels as determined by A1C levels. Standard treatments included any of the major classes of FDA-approved diabetes medications as prescribed by their study clinician: metformin, thiazolidinediones, insulins, sulfonylureas, exanatide, and acarbose. Combinations of medications could be used as needed to reach the treatment goal of a 7–7.9% decrease in A1C levels. Therapy for those in the intensive blood sugar group sought to achieve an A1C of less than 6%, similar to that of a person without diabetes. The study evaluated the effects of intensively targeting blood sugar control among adults with established diabetes, high blood sugar levels, and pre-existing heart disease, or at least two cardiovascular disease risk factors in addition to diabetes. In February NIH’s National Heart, Lung, and Blood Institute (NHLBI) stopped the intensive blood sugar strategy after an average of 3.5 years of treatment instead of the planned 5.6 years due to safety concerns: The intensive strategy group had a 22% higher risk of death, or 54 more deaths than the standard group. The increased risk began emerging within one to two years after the strategy began to aggressively lower the participants’ blood sugar levels. Approaches to managing type 2 diabetes include recommendations for combination therapies that may include insulin and oral drugs or oral drug combinations. Issues with some currently used drugs may, however, further complicate drug choices for clinicians and patients. In September FDA revised the prescribing information for Merck & Co.’s Januvia (sitagliptin), a dipeptidyl peptidase IV (DPP-4) inhibitor, and Janumet (sitagliptin/metformin). The fact that there have been 88 reported cases of associated acute pancreatitis prompted the agency to recommend that doctors monitor patients for the condition after either initiating sitagliptin treatment or increasing the dose. GlaxoSmithKline’s Avandia (rosiglitazone), a thiazolidinedione, carries a black box warning from the FDA due to its association with an increased frequency of heart attack. The agency decided not to remove the drug from the market after a 2007 advisory panel concluded that it was important for physicians to have rosiglitazone in their arsenal of treatments for type 2 diabetes. In June the FDA suspended Takeda Pharmaceuticals application for alogliptin, another DPP-4 inhibitor, because clinical data did not meet certain statistical requirements outlined in its December 2008 guidance. The company expected to launch the drug in March 2010, but requirements for a new study will likely push plans back two years. In July, though, the FDA approved Bristol-Myers Squibb and AstraZeneca’s DPP-4 inhibitor called Onglyza. Data from eight clinical trials did not show evidence of higher rates of heart attack, stroke, and other diseases. Despite these findings, the agency said it would require the companies to conduct a follow-up study of these diseases in high-risk patients including the elderly and those with existing heart conditions. The partners’ other type 2 diabetes drug, Dapagliflozin, an SGLT2 inhibitor, has thus far met its primary endpoints of reducing A1C in two Phase III trials. The second study revealed that the drug increased the risk of urinary tract and genital infections; Onglyza comes with a similar increased risk for urinary tract infections, so how much this will affect approval is yet to be determined. All this leaves physicians with the task of sorting out the best treatment as well as determining appropriate individual therapeutic goals. In 2008, results of a Veterans Administration study concluded that intensive blood glucose control yielded no significant effect on cardiovascular disease reduction. It was conducted among veterans with an average age of 60 at the outset of the 7.5 year study. “Pharmaceutical companies and the American Diabetes Association continue to promote using glucose level-lowering drugs in type 2 diabetes mellitus to attain an HbA1c level below 7% despite recurring evidence of potential harm and scant evidence of benefit,” commented Stephen Havas, M.D., professor of epidemiology, University of Maryland at Baltimore School of Medicine, in a letter to the Annals of Internal Medicine. Meanwhile, diabetes drug development will likely become more challenging as drug developers must now show that type 2 diabetes candidates do not increase risk of cardiovascular events based on formal statistical criteria. The new standard is in effect and impacts all drugs and biologics currently in development. Patricia F. Dimond, Ph.D., is a principal at BioInsight Consulting. Email: drpdimond@comcast.net.